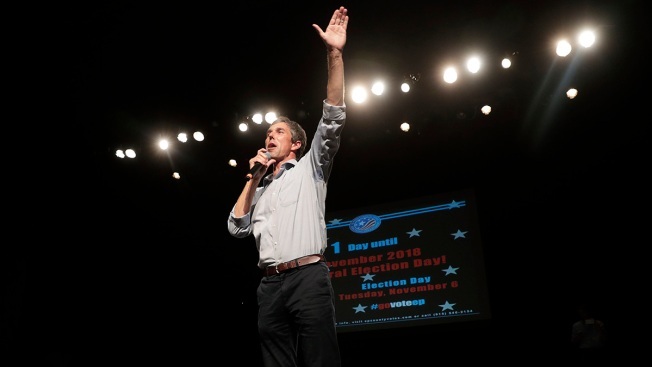 FILE - U.S. Rep. Beto O'Rourke, D-El Paso, who narrowly lost his 2018 Senate bid to incumbent Republican Sen. Ted Cruz, speaks during a campaign rally, Nov. 5, 2018, in El Paso, Texas. Democratic rising star Beto O'Rourke's team has been fielding calls from senior operatives who worked on President Barack Obama's campaign in the pivotal states of Iowa and New Hampshire as the Texas congressman considers running for president in 2020, CNBC has learned. Led by chief of staff David Wysong, O'Rourke's inner circle has been engaging with political players from the states, which hold the earliest contests of the presidential primary season. These people include leaders of Obama's campaign operations in the states, according to multiple people with knowledge of the conversations. While people close to O'Rourke insist that the discussions have not led to any hires, a former senior Obama administration official, who spoke on the condition of anonymity, said it is clear O'Rourke will have the consultants in place to help guide him if he chooses to make a run for the White House. "This is the phase for someone exploring a presidential campaign in that they're doing everything they can to decide who they may want to run an organization and who they could turn to if he enters the race," the former Obama aide said. O'Rourke is fresh off a surprisingly close defeat at the hands of GOP Sen. Ted Cruz in reliably Republican Texas. He has been credited with lifting fellow Texas Democrats in House races to victory last month as the party flipped about 40 seats to take the majority. O'Rourke broke fundraising records and galvanized young voters in his Senate campaign, a possible indication of the kind of appeal Democrats will need to take on President Donald Trump. Yet, the fact that he lost a statewide race is giving some in the Democratic Party pause about a potential O'Rourke run. "You don't promote a loser," Chicago Mayor and former Obama White House chief of staff Rahm Emanuel said recently. Momentum for a potential O'Rourke 2020 campaign appears to be building, nonetheless. Wysong, the congressman's chief of staff, talked as recently as this week with a former co-chair of Obama's New Hampshire organization, according to a person with direct knowledge of the phone call. According to this person, who declined to be named in this story, the former Obama campaign official reached out to Wysong and offered advice on how to navigate the state if O'Rourke were to jump into the race. "It was a very cordial and preliminary conversation," this person explained. They discussed some of the oddities, as well as the political hurdles, that Democrats face when running for president in New Hampshire, according to people briefed on the matter. In Iowa, O'Rourke's contingent has heard from Troy Price, chairman of the state's Democratic Party. Price served as Obama's Iowa political director during the president's 2012 re-election campaign. Hours after publication, and repeated attempts to contact him, Price on Thursday denied he had heard from anyone on O'Rourke's team. Iowa and New Hampshire are two of the first hurdles for anyone looking to become their party's nominee for president. Obama won the 2008 Iowa caucuses but lost the New Hampshire primary to Hillary Clinton. In 2016, Clinton won Iowa but lost New Hampshire on her way to defeating Sen. Bernie Sanders to become the party's nominee. Wysong referred a CNBC inquiry to O'Rourke's campaign spokesman, Chris Evans, who declined to comment. Presidential buzz for O'Rourke started taking hold while he was on the campaign trail this year, but he responded by saying he wouldn't run. Recently, however, O'Rourke said he is no longer ruling out a presidential bid. The buzz around him has only grown since Election Day. A key New Hampshire Democratic group invited him to the state to meet voters and strategists. Supporters and donors, meanwhile, are encouraging him to run for Senate again in 2020 or set his sights on the White House. O'Rourke met with Obama himself in November, more than a week after the midterms, according to the former Obama administration official. The Washington Post first reported the meeting. Obama has praised O'Rourke in public and likened the Texas Democrat to himself. "It felt as if he based his statements and his positions on what he believed," Obama said in a recent interview on "The Axe Files," a podcast hosted by his former top political advisor, David Axelrod. "And that, you'd like to think, is normally how things work. Sadly it's not." Obama and his former aides' interest in O'Rourke comes as former Massachusetts Gov. Deval Patrick decides against running for president. Patrick had been telling associates he doesn't want to get involved with the race, according to a person close to him. Patrick is an Obama ally, and people associated with the former president had been encouraging Patrick to jump into the race for at least a year. In a Facebook post on Thursday, Patrick confirmed that he will not be running for president in 2020. "After a lot of conversation, reflection and prayer, I've decided that a 2020 campaign for president is not for me," Patrick wrote. "Knowing that the cruelty of our elections process would ultimately splash back on people whom Diane and I love, but who hadn't signed up for the journey, was more than I could ask," he added.